Thinking of Remodeling your Kitchen or Bathroom? Some things to Consider. 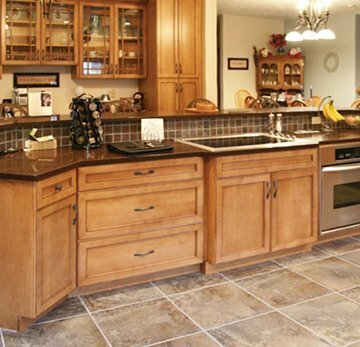 Home >> Blog >> Thinking of Remodeling your Kitchen or Bathroom? Some things to Consider. First it starts with an idea. An idea to remodel your kitchen or bathroom. But where to start? Sure you’ve seen lots of remodeling shows making the process look quick and easy. Well in reality quality remodeling is not as simple or as quick as a 30 minute TV show might lead you to believe. Depending on complexity some projects may take just a few weeks while others can take several months from conception to completion. At Bailey’s we understand how remodeling works. Our years of experience allow us to provide the service you deserve. We will walk you through the process from beginning to end. Our goal is to create kitchens and bathrooms inspired by your lifestyle. Budget and Timing – First, consider your budget when planning your project. A good rule of thumb - plan to spend anywhere from 10-20% of the value of your home for a full turn-key kitchen remodel. Keep in mind what’s most important to you. The quality of the cabinetry, countertops (granite or quartz) and appliances all can be managed within your budget. Same for bathrooms with considerations for tile and fixtures. Full remodels are not inexpensive however they do add value to your home and improve the quality of living. Second, and just as important to consider, what’s the best time to do the construction? Will you be having Thanksgiving dinner or family for the holidays? Plan on having your project complete with enough time to settle into your new space. Designs and Selections – So you have an idea of what you want and a budget on how much to spend. Now it’s time for the fun part! When you enter a Bailey showroom you will be offered a hot or cold beverage as you browse the showroom displays. One of our Design Consultants will introduce themselves and begin to ask about your project. We need as much information as possible to help interpret your ideas so we can make them a reality. We can also meet at your home for the initial or follow up consultation to take notes and measurements of your current space. Planning your kitchen or bathroom will take time. Be careful to spend your time wisely and select exactly what you’re looking for. Selections will include cabinet wood species, door and drawer styles, color - paint or stain, countertop material, granite or quartz. Be sure to choose colors and themes to match cabinets, floors and walls. Same process for the design. We will interpret your ideas and incorporate them into a unique plan showing 3-Dimensional perspectives of your new space. We will be there to help with the design and selection process as we understand the number of choices can sometimes be overwhelming. Refining the plans – Once you’ve relayed your design ideas and made selections we will present you with an initial design along with a quote for materials and labor to complete your remodel. Take your time to review these documents carefully as they represent our initial interpretation of your ideas. Next we may need to refine and our concepts to make sure they match with yours. Sometimes your initial ideas can change as we present you with different options to enhance your space even more. For example, perhaps the countertop you like has a lower priced alternative so you can upgrade to the cabinets you fell in love with and have to have. We’re happy to make those changes keeping in mind the overall budget. Our goal is to ensure all the details are in writing and you have a very clear understanding of what the finished project will look like. Moving Forward – Now that you’re excited about your new design and selections, the timing is right and you’re ready to proceed with your project. Our Design Consultant will review the agreement and payment terms, timing of the project, and what to expect during construction. After the agreement is signed the ordering process begins. We will coordinate our orders based on your schedule and availability for us to do the work. We will schedule the deliveries and any Bailey Certified Installers needed to complete the work. Remember as we get closer to work commencing you will need to pack up your kitchen or bathroom just like you’re moving out. As the project begins we will prepare your home for construction and the demo which can sometimes be dirty and loud. Our goal is always to keep the dirt and noise to a minimum. The next phase is construction and rebuilding of the new space including walls, flooring, and cabinets. Once cabinets are installed the countertops will need to be templated to ensure a good fit. After the countertop template is complete, the granite or quartz will be fabricated and installed - typically 7-10 days later. After countertops - appliances, tile, sinks and faucets are installed. Your project is nearing completion and your original ideas are becoming reality. Project Completion - You’ve made it this far and are now close to having your project complete. You’ve been using your microwave, outside grill, and been ordering takeout while the construction continues. You can’t wait to move back into your brand new kitchen. But before we are 100% complete we want to make sure everything has been installed correctly and functions properly. We want to make sure your new kitchen or bathroom exceeds your expectations and want you to enjoy your new space for years to come. After all you’ve chosen Bailey’s to deliver your Lifestyle Inspired Kitchen or Bathroom. Our goal is to have every customer recommend us. Enjoying your new space – Now that work is complete and you’ve returned to living in your new kitchen or bathroom you’ll notice things are a little different. Maybe the sink is now in your new kitchen island or your bathroom vanity is a little taller. It may seem strange at first since you’ve been used to the old space for a long time. But soon you will get comfortable with your brand new cabinets, countertops, and appliances. You will fall in love with your new shower. The new convection oven roasts perfectly and you have so much more storage in your 42” high wall cabinets. Finally you feel like your original idea was a good one, no a GREAT ONE! Go ahead and show off your new space. Have an open house and let your friends and family compliment you on your renovation. You’ve now been through the process and have a home to be proud of. We’re just glad you chose Bailey’s to help make it all happen.